For centuries, the human body had been reinterpreted through various artforms from Greco-Roman paintings, modernist sculptures, photography and film. High-fashion designers and small independent brands alike also seem to take inspo from the human body. With every passing season, we are seeing more and more designers exploring novel ways to celebrate the human figure creating clothes and accessories shaped in organic forms. From surreal couture-like RTW iterations to subversive yet wearable body wares, the following brands will make you want to show off your curves! 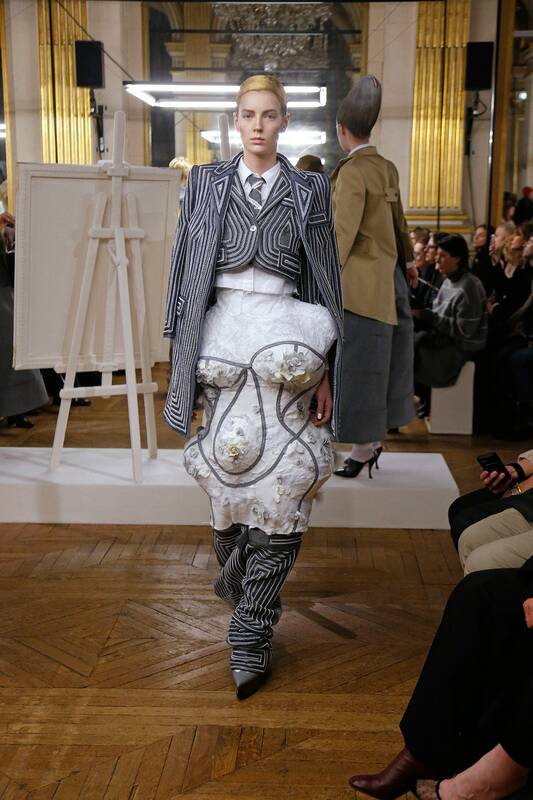 Widely recognized and beloved for his precise craftsmanship and innovative use of textile, Thom Browne’s runway shows always succeed at providing unforgettable moments of strong visual impact. For his Paris Fashion Week, Autumn/Winter 2018 presentation, Brown drew inspiration from 18th-century artist Elizabeth Vigée Le Brun, who was Marie Antoinette’s official portrait painter. Crafted from a grey-hued mix of flannel, tweed and silk moiré with meticulous embroidery, impeccably tailored suits, coats, vests, cropped wide-leg trousers and hybrid gowns, cut and sculpted to achieve protruding curvaceous silhouettes, took center stage as models, coiffed in extreme beehive hairdos, walked and stroke a few poses to Madonna’s Vogue. Constructed from shiny gold-tone brass, Chloe’s Femininities necklace profers great contemporary design while lending a novelty touch to the brand’s cool-girl bohemian aesthetic. Featuring a bold curvaceous pendant reminiscent of abstract modernism sculptures, this style looks great hanging alongside other sentimental pieces.